This post describes the results of Internet scanning we recently conducted to identify the users of FinFisher, a sophisticated and user-friendly spyware suite sold exclusively to governments. We devise a method for querying FinFisher's "anonymizing proxies" to unmask the true location of the spyware's master servers. Since the master servers are installed on the premises of FinFisher customers, tracing the servers allows us to identify which governments are likely using FinFisher. In some cases, we can trace the servers to specific entities inside a government by correlating our scan results with publicly available sources. Our results indicate 32 countries where at least one government entity is likely using the spyware suite, and we are further able to identify 10 entities by name. Despite the 2014 FinFisher breach, and subsequent disclosure of sensitive customer data, our scanning has detected more servers in more countries than ever before. 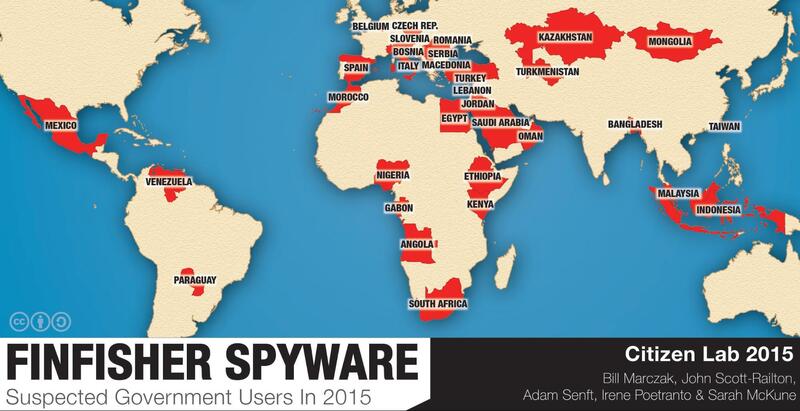 Here's the map of suspected FinFisher users, including some pretty reprehensible governments. Introducing FortiOS and FortiClient v5.4 Beta 1!